Quinns: Phew! Paul and I are back from Gen Con and I’m $200 poorer after being charged by United Airlines for my overweight bag, stuffed as it was with board games and gifted bourbon. I know! Your heart bleeds, right? Huge thanks to everyone who came to our extra-ridiculous live shows. They’ll be up on the site in the coming weeks. 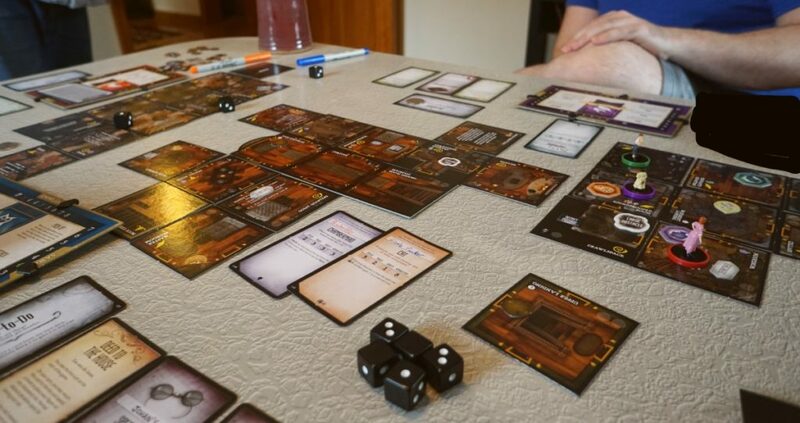 Huger thanks still to the rest of you for being patient during this site’s quiet time, and we’re going make it up to you with a whole series of dramatic reviews showcasing the best games we found at Gen Con, including Captain Sonar, Seafall and Inis, but we’re starting right this second with Smirk & Dagger’s Dead Last. 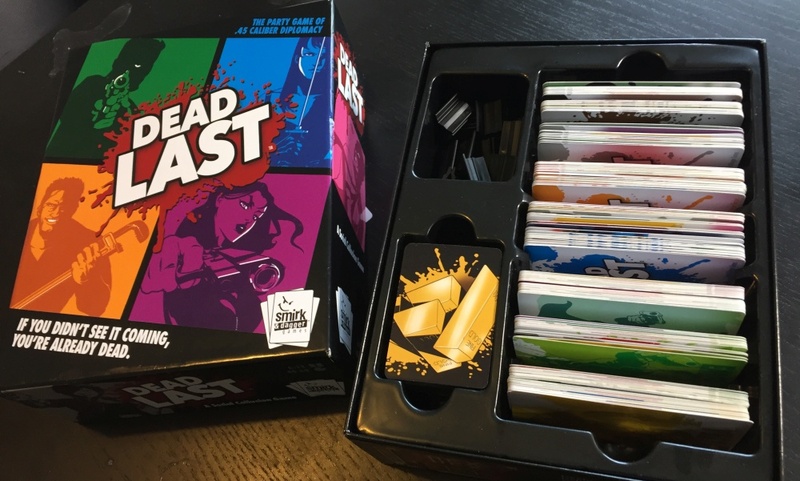 So Dead Last is basically Ca$h ‘n Guns meets Diplomacy, it’s the best new party game I’ve played all year and it’s the first game this site’s covered that will play completely differently depending on the size and shape of your table. Do I have your interest? Come with me! I promise I won’t shoot you. 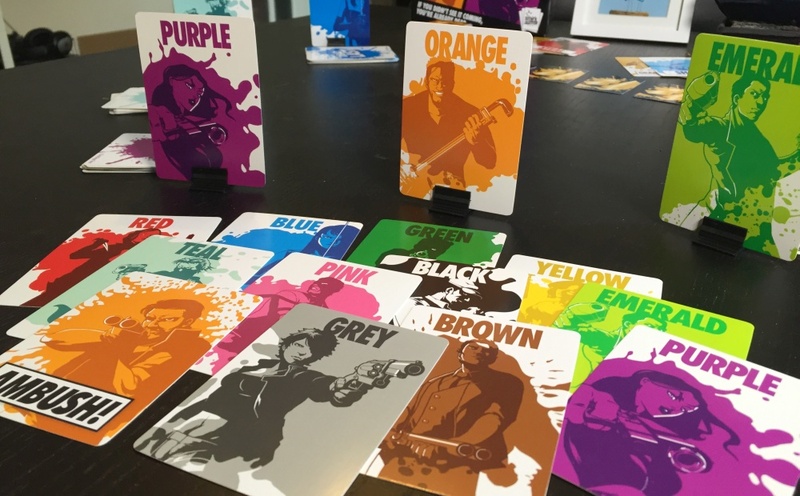 Dead Last – and please, take a moment to appreciate that name – begins with 6-12 players sat around a table, each with a coloured standee, a private deck of cards and an unusually shifty look. As soon as the game begins people will start murdering each other by consensus and/or killing themselves by accident, and your objective is to be one of the last 2 people left standing. Isn’t that an exquisite opening to a rules explanation? It’s simply one card showing every other player, and one in your own colour reading “Ambush”. The rules themselves couldn’t be simpler. As soon as the game begins (or possibly even before that), everyone starts coming to a decision as to who to kill without letting that player know. You might do this by leaning backwards from the table and gesturing madly at your neighbour. You might make eye contact with a player opposite you and flick your eyes at a target. You could flash a coloured card at other people, pluck at your shirt (which happens to be someone’s colour) or use that colour in a sentence. The sky’s the limit. Actually, no it’s not. If the sky’s a certain colour you could point at it and use that too. Whenever you’re ready (which usually takes no more than 60 seconds), everyone puts a card facedown showing the colour of the person they’re trying to kill. Once everyone’s card is down you all reveal your cards and four things happen, each more awesome than the last. The capital letters below are a mix of terminology from the game and my own enthusiasm. I can’t help myself. I love this game too much. ONE: See which colour got the most votes. That player is the TARGET and DIES. If there’s a tie for most votes, ALL tied colours are TARGETS and DIE. TWO: Any players who did not vote for a target ALSO DIE! So even if you’re confident that nobody’s out to get you, you’re still under pressure to play the right card. THREE: Wait! Did any of the TARGETS play their COOL AMBUSH CARD?! If so, they don’t die and can pick one of their assassins to die, presumably because they were waiting in the toilet with a shotgun. This is why you can’t let anyone know that you’re voting for them. 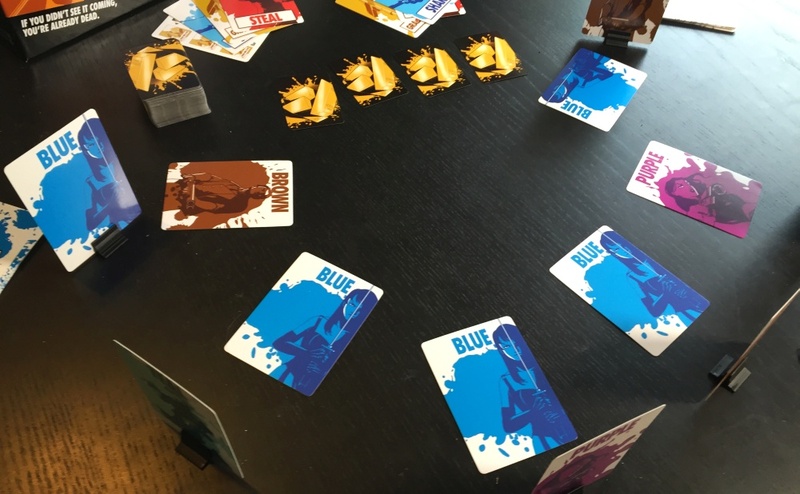 Everyone’s deck includes an ambush card in your own colour, and playing it is always an option. FOUR: Yes, we’re still going. Did you play your ambush card when you weren’t the target? Great! YOU DIE. I’ve got a nagging feeling that you could fit this whole rules explanation to tune of Hamilton’s 10 Duel Commandments, but it won’t come from me. Not today, anyway. I’m so tired I just went to make a tea and walked full-speed into a door frame. Aside from Conan being able to run through walls in Monolith’s Conan board game for the same amount of action points it takes him to open a door, Dead Last’s ambush card is my favourite single rule from all of the games I tried at Gen Con. Anyone who’s played Werewolf or The Resistance will know the sad, irrepressible feeling of group consensus turning against you. It’s not just that Dead Last offers a way out, allowing you to duck the killing blow. Whether your ambush works or not, it’s entertaining for the whole table. Speaking generally, half the time ambushes mean you get to watch an underdog dropkick the evil genius out of the round, and half the time ambushes are a display of hilarious paranoia where panicking players eliminate themselves. 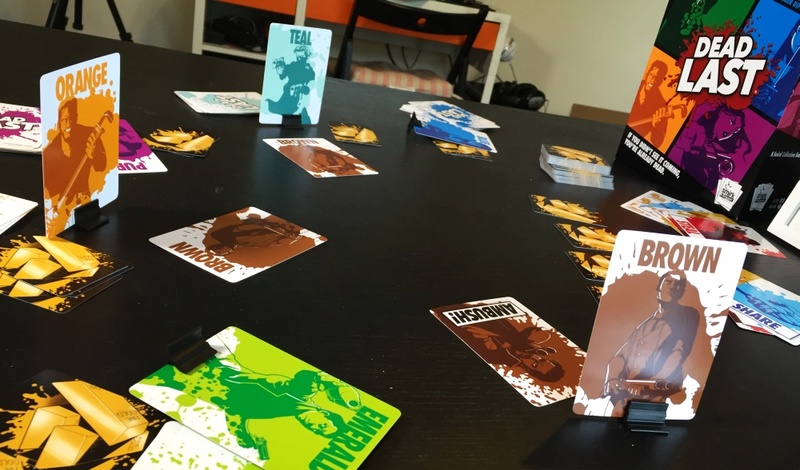 All dead players flick over their standee and the survivors go again, gradually whittling themselves down to two people in a series of faster, more dangerous and more entertaining rounds. Don’t worry about the player elimination, this game’s a fantastic spectator sport and nothing stops you from conspiring with other dead players in preparation for next round. When you’re down to two survivors they obviously can’t play the game of Dead Last any longer, so they have to divide up the round’s four loot cards by playing a “Final Showdown”. Considering the slaughter that’s just occurred in the previous few minutes, the final showdown is laughably polite. Each survivor is given three cards reading “Share”, “Steal”, and “Grab One & Go”. Both players then discuss what they’re going to play, a conversation that always boils down to both players saying “We’ll share this, right?” but with varying amounts of sincerity and hysteria in their voice. Finally, each survivor places a card face-down, and both cards are turned face-up. If both cards are “share”, each player gets 2 of the 4 loot cards. If a steal is played against a share, the stealer gets all 4. If both of you play steal, you both get nothing and every dead player gets a loot card. 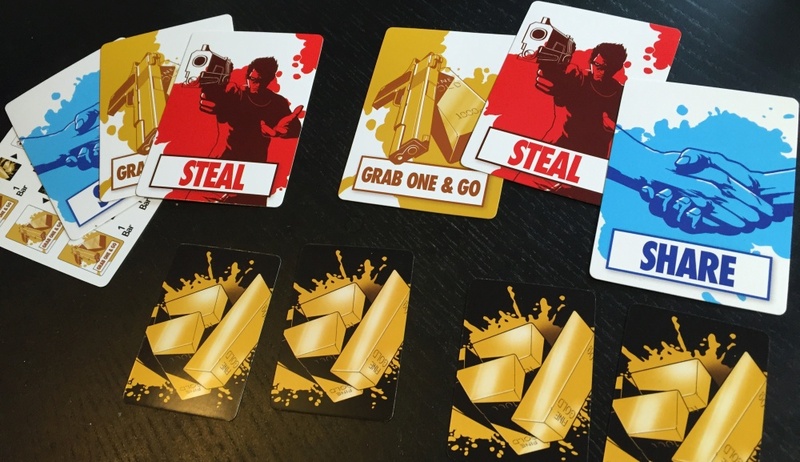 Grab One & Go does what it says- anyone who plays it gets one of the loot cards, and any players who stuck around to steal or share get the other three. In other words, yes, the Final Showdown is just The Prisoner’s Dilemma but with both players sat on ejector seats. And honestly, this sort of happy borrowing of existing games is an ethos I’d love to see more of in the board game scene. 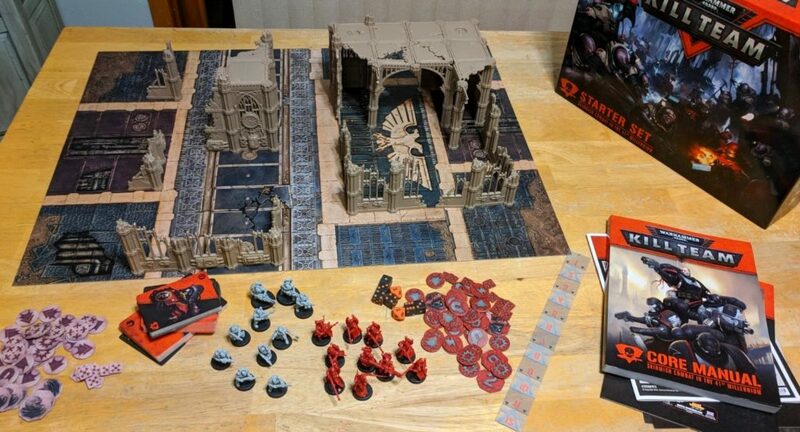 I’m all for designers racking their brains to invent wild new rulesets, but once you’ve had your brilliant idea(s) there’s no shame in filling any gaps in your design with ideas and systems lifted from other games. Doubly so if it’s an idea that we haven’t seen for a while. Once the loot’s been divvied up everyone recovers from their bullet wounds and you start a brand new round, full of possibility, though maybe not as much as in the first round since players may have already decided who they’re going to kill. As to when the game ends, there are random numbers on the back of each loot card and you’re racing to collect 25 total loot, which means earning around seven cards. This process could take 30 minutes, but it’s more likely to take 45 minutes considering that the more loot a player has the more likely it is that players put their colour on the bottom of their decks, the better to secretly gesture with. That’s it! That’s your game. And it’s so, so good. And not just because practising magicians are going to have a real advantage as they make cards appear and disappear. Dead Last is as simple as it is funny and tricky, but what I like most is that it’s unlike anything we’ve reviewed in five years of SU&SD. It’s fresh like a breath mint. From the instant you start playing everyone is given the chance to invent techniques of how to play this mad new game, which is both entertaining and liberating, but there’s so much more to it than that. Like Codenames, Dead Last is awesome because all the humour comes from your friends being clever, from your friends making mistakes, and from your friends failing to spot your genius. 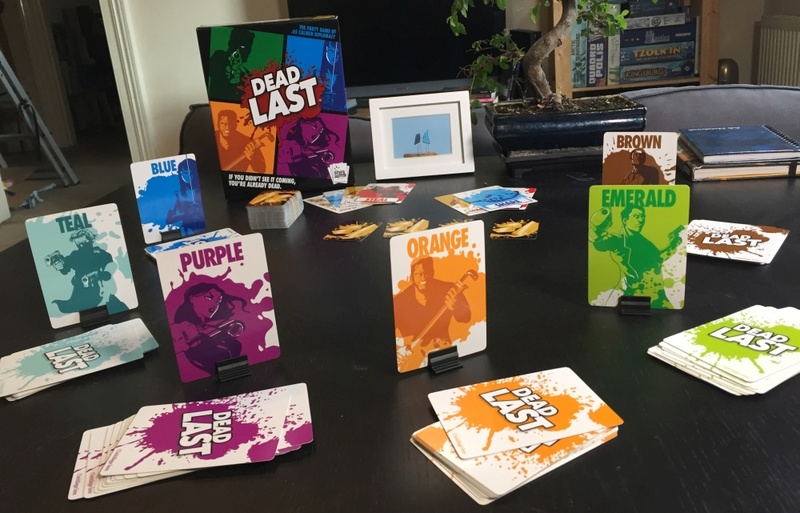 Except unlike Codenames, Dead Last lets you watch and then steal other people’s techniques. Or should I say, try to steal other people’s techniques. It’s the board game equivalent of a dance floor. You’re at once doing your own thing and watching other people, enjoying and judging, but at the same time creating a single, beautiful, adaptive entity. But better even than funny plays are the funny mistakes you’re going to make. I’ve been killed in Dead Last because someone was able to trick me into explaining a rule, and while I was bent over the table everyone agreed to kill me. I’ve also been killed because I passed on a message to “kill orange” to my neighbour, only for him to ambush me because I forgot he was orange. The equivalent of handing a player a card in Cockroach Poker, forgetting they’ve already seen it. But equally, it’s a game that gives you the chance to display heinous, unsurpassed levels of cunning. The easiest way to survive a round when there are only 3 or 4 people left is to decide who’s going to die before it’s even started. I was startled when someone who worked at Smirk & Dagger tipped me off that I was going to die and had me play an Ambush, which led to me liking him and protecting him for the rest of the game. There was also the case when someone I was playing with ran the game for a good 15 minutes because she fanned her cards out with one of them turned around, getting her neighbours killed over and over again because they could only see the sides of her cards. If you’re ever in a situation where 6 to 12 people are willing to play something a little devious, you just have to buy Dead Last. That’s how strongly I feel about it. 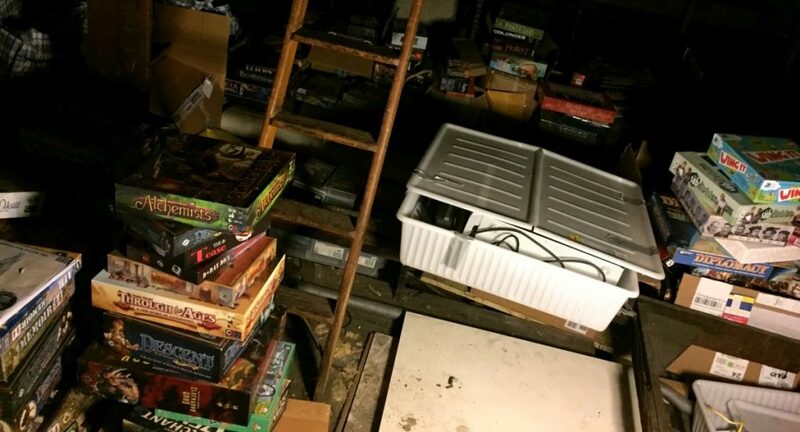 And if you’re after an expansion, all you need to do is try playing on a cramped table, one that’s too big, or one that’s rectangular, or round. Right now, if I have the minimum 6 players I’d absolutely rather play Dead Last than Ca$h ‘n Guns. But we also took home from Gen Con both of the new expansions for Ca$h ‘n Guns second edition, so who knows which of these two games will survive? 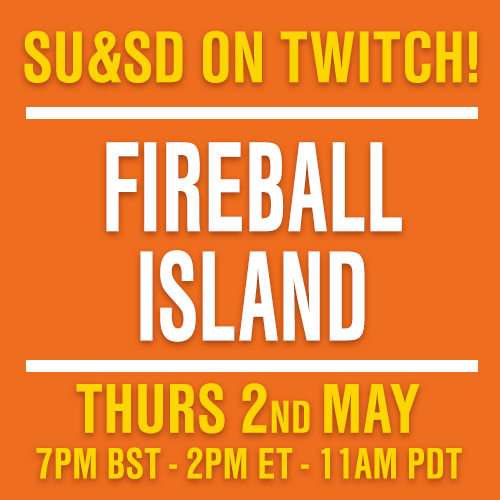 We’re gonna have to get those expansions played, see if they elevate C&G, and then have ourselves a good, old fashioned Mexican standoff.